Built to Last, the defining management study of the nineties, showed how great companies triumph over time and how longterm sustained performance can be engineered into the DNA of an enterprise from the very beginning. Level 5 Leadership: A surprising style, required for greatness. The Hedgehog Concept: Finding your three circles, to transcend the curse of competence. A Culture of Discipline: The alchemy of great results. Technology Accelerators: How good-to-great companies think differently about technology. The Flywheel and the Doom Loop: Why those who do radical restructuring fail to make the leap. A Dearth of Information in One Book! This is probably the most comprehensive history of the Jewish people out there contained in a single book.It contains an overview of the biblical record and covers the diaspora, medieval period, foundings of Zionism, the Holocaust as well as a decent description of the events leading up to problems in the Middle East that endure to this day.It is definitely not light reading, however, and events are not always described in chronological order.For these reasins I only gave it 4 stars, but it deserves a strong 4.5. Paul Johnson's books always offer vivid portraits of diverse peoples, places, and events. The breadth and variety is what makes his books such great reads. One of his best achievements is "A History of the Jews." Although Johnson is a practicing Christian, this has not prevented him from writing a very interesting, worthwhile, engaging and fair history of the Jewish people. The book covers very well the early history of the Jews, beginning with the Israelites of biblical times through developments in Jewish thought and migration in medieval times. He also covers well how the Jewish people and Jewish traditions evolved in the modern era, culminating in one of civilization's greatest evils, the Holocaust, followed by one of the greatest achievements of any people in our time: the creation of the modern state of Israel. Johnson's book is a very important survey that everyone should have the privilege of reading. But one area where Johnson writes far too little is about what happened to the Jewish people who remained in Poland following the Second World War only to become scapegoats of a desperate Communist government. An excellent book on this topic is Arthur Wolak's "Forced Out: The Fate of Polish Jewry in Communist Poland." I loved this book. One of the things i loved was the way the author connected everything together. Plus their was so many new things I learnt in this book. On the other hand, this book had so much information to offer it made it a little bit hard to read forlong periods of time. This book is a great reference book.But it was definitely one of the most interesting books on Jewish History. 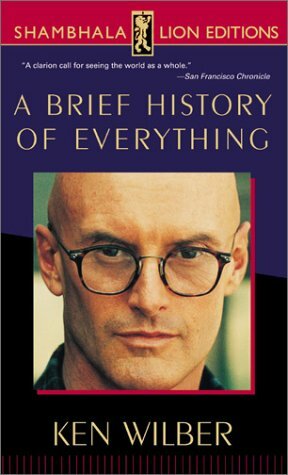 For any person who wants to know what to read for his first book on Jewish History I would advise him this book. After you will finish this book you will a broad knowledge on almost every aspect on Jewish History. I probably would not have become aware of this excellent book, had not some Jewish friends recommended the AISH.com website to me, thinking no doubt that I needed a more balanced view about Jewish history.I am grateful to them for so doing! One of the most interesting items on that website was ?Crash Course in Jewish History? by Rabbi Ken Spiro in which he recommended many books including this one.I ended up buying not only his book, ?World Perfect ? The Jewish Impact on Civilization?- (ISBN 0-7573-0056-1), but several others including this book.Up to this point in time, my knowledge of Jewish History ended with the first Jewish revolt against the Romans, and I was almost completely ignorant about their history after that. I read Rabbi Spiro?s book first, mainly because it was shorter, and I am glad I did, because it prepared me very well for reading this very detailed book on Jewish history. I particularly like the structure of the book which is in seven nicely delineated parts ? Israelites, Judaism, Cathedocracy, Ghetto, Emancipation, Holocaust, and Zion.It was not until midway through the section on Judaism, that I realised that I would have to be a little more rigorousin my reading of the book, because not only was there a wealthof detail about Jewish scholars and notables, but there was also considerable explanation of their basic philosophy which I needed to properly understand in order to avoid being overwhelmed. So I set up my own dictionary of people in a PC workfiles, as well as looking up what websites there were about them.This was an interesting exercise, and I found a lot of useful supplementary information to fill in some details about the lives of these individuals. The task became even greater when I reached the middle of the Emancipation on because the number of names seemed to be increasing on every page!This is not a criticism of the book, because it quite convincingly demonstrated the enormous contribution that the Jewish people have made to our civilisation, particularly since the beginning of the 18th century. 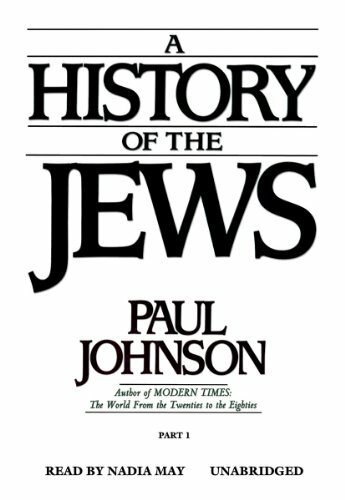 I found this book to be balanced, sympathetic, and thorough.Johnson describes in detail the sorry catalog of horrors that the Jews have suffered over the last 2500 years in Europe and Asia, as well as the beliefs and philosophy of their leading scholars from the time of the first Jewish revolt against the Romans to the modern era. 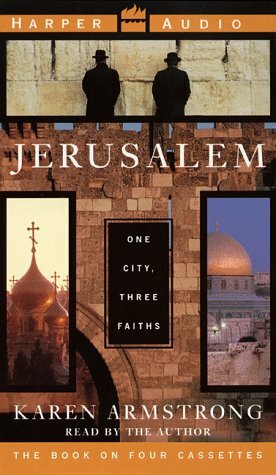 How the various Jewish communities responded to the many difficult predicaments they faced firstly with the Roman Empire, then with the Christian Church, then with Islam, and finally with the Christian States of Europe which have emerged during the last 800 years or so, is told with great sympathy and understanding. Johnson provides ample detail on the contribution of the Jew and Judaism to the philosophy, the culture, and the development of democratic ideals of the modern democracies (which is also the main theme of Rabbi Spiro?s book).His theme is that time and time again, Jewish communities, even though there were usually major restrictions on their activities, would find ways to make a living and to be useful to the monarchy and the nobility, who then would use them as scapegoats when major economic and social disasters struck. In particular, he shows how the basic arguments and slanders used by the Medieval Churchwere used and embellished by later anti-Semites.While anti-Semitism is not the major theme of this book, it does, in my view, deal with the problem fairly and squarely, and particularly well for the past 200 years or so, when eastern Jewsbegan to emerge from their ghettos in increasing numbers. His description and explanation of the rising anti-Semitism during the 19th century, and its sudden emergence in Germany culminating in the Holocaust was particularly careful and thoughtful. His account of the roots of the seemingly never ending Middle East crisis and the creation of the State of Israel was even handed and sensitive, and I think it extremely important to be as well informed as possible about the root causes of this struggle in order to determine what should be done about it today. He makes the point that the rise of Arab nationalism after the collapse of the Ottoman Empire took place a little later than that of Jewish nationalism, but that it was nevertheless latent during the early 20th century when Theodor Herzl and his successors were making great efforts to push for the creation of a Jewish state in ?Eretz Israel?.I was not aware of many of the events of the 30 years leading up to the creation of the state of Israel, and while I was generally familiar with the first 25 years of its existence, I was certainly not well informed of all the details. I found Johnson?s description of the wars of survival, the religious parties, and population growth, a useful reminder of the internal as well as external issues which Israel currently faces. I very much enjoyed reading this book.It was interesting, it provided the depth of detail I was looking for, and it met my expectations completely.I am sure there are many other books on Jewish history which I would find equally absorbing, but this is the one I happened to choose first.I am happy to have read it and would thoroughly recommend it to allpotential readers, whatever their religious beliefs or upbringing. So I set up my own dictionary of people in a PC workfiles, but found that I needed to go further by looking up what websites there were about them.That was an extremely interesting exercise, and I found a lot of useful supplementary information to fill in some details about the lives of these individuals, and of course, it took me longer to finish the book.The task became even greater when I reached the middle of the Emancipation on because the number of names seemed to be increasing on every page!This is not a criticism of the book, because it quite convincingly demonstrated the enormous contribution that the Jewish people have made to our civilisation, particularly since the beginning of the 18th century. First published in 1972, The Great Bridge is the classic account of one of the greatest engineering feats of all time -- the building of the Brooklyn Bridge. 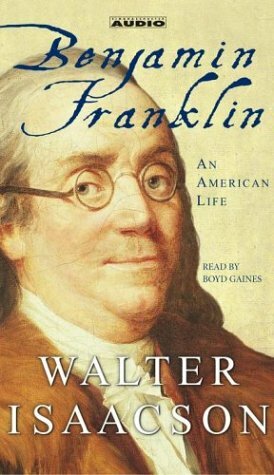 This monumental audiobook which presents extended unabridged passages from the book brings back a heroic vision of the America we once had. It is the enthralling story of one of the greatest events during the Age of Optimism -- a period when Americans were convinced that all great things were possible. McCullough is an amazing researcher and writer. His narrative style turns almost unknown historical events into "epic stories." And "The Great Bridge" is no exception. I came to know McCullough after "John Adams" was published, but have since decided to take the time to read all of his works. He never ceases to amaze me. "The Great Bridge" is a well-written, interesting, detailed history of the Broklyn Bridge, the Eight Wonder of the Modern World. The characters come to life in this story, and the reader is transported into late nineteenth century New York City as an insider to watch the bridge rise from the caissons below the East River to the two gothic arches that dominated the skyline at their completion. From there, the reader can vividly visualize the wire and roadway stretch across the river until the bridge's completion. The book then ends with a spectacular grand opening of the Brooklyn Bridge. McCullough also focuses on the politics and people behind the bridge, and finishes his masterpiece by quoting an elderly woman from Long Island that remembers that the excitement in 1969, when two men walked on the moon, was nothing compared to the day the Brooklyn Bridge opened. 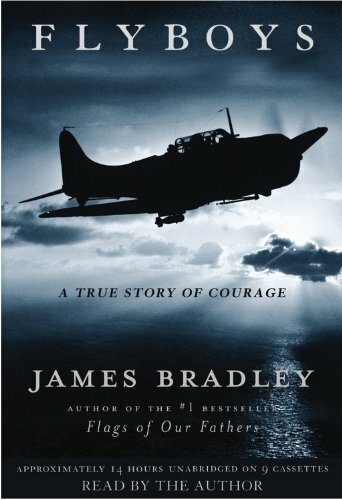 I recommend this book to anyone who appreciates good history. This book is not just for lovers of New York City and civil engineers. 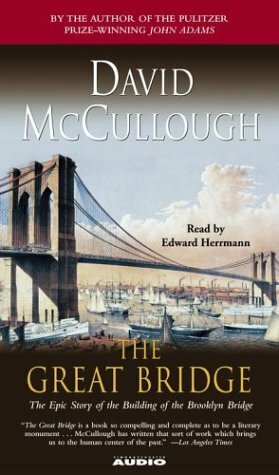 "The Great Bridge" is another McCullough masterpiece. A classic mix of engineering, social and medical history. It would be difficult to overpraise this splendid book - and indeed one might have thought it a unique achievement had McCullough not pulled off the trick equally well in "The path Between the Seas". The main theme may be the conception, design and construction of the Brooklyn Bridge, but into this are woven absorbing accounts of the social and political history of Gilded Age New York, the development of the technologies of underwater-foundations and of cable manufacture and spinning, the agonising quest to understand and treat the phenomenon of "the bends', the challenge of managing a project of a size unprecedented since classical times and, above all, the characters of a remarkable collection of men and women who were undauntedly resourceful in taking on the impossible. 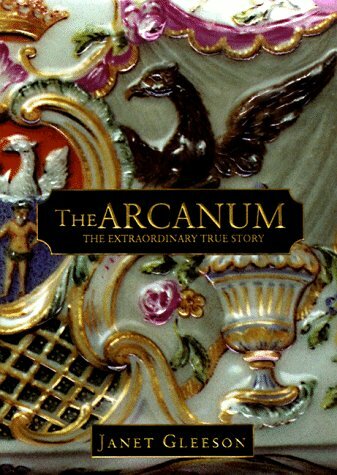 The story may be dominated by two engineers, the Roeblings, father and son, and by the latter's formidable wife, but a host of other fascinating personalities are brought to life, ranging from audaciously corrupt politicians, through noble and heroic army officers, down to individual technicians and workers. Mr.McCullough has a special gift for explaining technical complexities in simple and fascinating terms - this applies not only to the construction of the bridge and its foundations, but to the horrific and initially misunderstood challenge of what was termed "caisson sickness". The narrative never flags and the dangers and discomforts - indeed the sheer dreadfulness of working under pressure in the foundation caissons - are brought vividly to life. The writer excels at the moments of the highest drama - such as the almost catastrophic fire in one of the caissons, when the tension is almost unbearable, even when the final outcome is known to the reader a century and a quarter later. 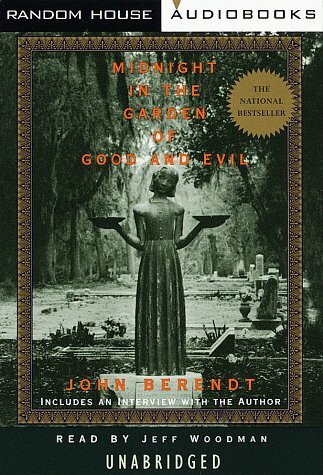 Every aspect of American life of the period seems to be covered somewhere in this book - the experience of immigration and assimilation, service in the most bloody campaigns of the Civil War, Spiritualism, the Beecher adultery scandal and the apogee, decline and fall of Tammany, all described with verve and elegance. The well-chosen illustrations complement the text admirably. In summary this is a book to treasure - to read once at the gallop, breathless to know what happened next, and then to read again at leisure - and again, and again. Wonderful! "...and yet the bridge is beautiful..."
In this day and age, what the name David McCullough means to part-time history buffs and amatuer historians (like myself) is excellence in writing, research and comprehensiveness. This reputation was undoudbtedly built based on classics like "The Great Bridge", written in 1972. Herein, the reader is exposed to spectactular writing and research that not only covers the planning and building of the Brooklyn Bridge, but indeed a history of the Gilded Age in New York city. With an enlightening style and insight that exceeds most other histories, McCullough defines "readable history" and in the process produces a classic that has and will continue to be the apex of literary history. And what a story it is! Following the Civil War, master bridge builder John Roebling decides that a great suspension bridge between Brooklyn and New York city (present day Manhattan) is not only needed, but would continue his reputation as bridge builder par-excellance. His son, Civil War General Washington Roebling (notable at Gettysburg and Petersburg) becomes Chief Engineer when his father tragically dies during the initial stages of construction on the bridge and proceeds to project an aura of moral integrity and spiritual "high-ground" that sets the tone for the subsequent 14 years that it took to complete this masterpiece. McCullough's account documents this and goes on to explain the initial planning and technical issues of such a massive project. The theory of suspension bridges and all the engineering technicalities is succinctly described by McCullough and this base understanding is what the rest of the story is based on (wires/cable hung form two large towers is the base format). The construction of the (2) towers is eloquently descibed at the sinking of the timber caissons (large "rooms" made of timber that the stone towers were to be built upon) and the subsequent details of working within them. Frustration abounds as the the Brooklyn side tower caisson goes slower than planned and McCullough describes the technical problems along with an amazingingly comprehensive discussion of the "mysterious maladay", ultimately known as the "bends". Worker-level stories surface here to give immediacy to the story and McCullough is masterful at describing them. The cable construction and subsequent controversey surrounding the contract and testing of the steel/iron would be boring to most readers, but McCullough makes this an intriguing part of the story. The political side of the bridge construction is not given short-shrift either as McCullough deftly descibes New York city Gilded era politics and specifically discloses the rise and fall of the "Boss Tweed Ring" and Tammany politics in general. This side of the bridge story, McCullough states, is as important to the final product as the engineering and construction...again, he makes this exceedingly readable while extolling it's importance to the story. Commitee upon commitee are formed to decide on both the technical and personal issues associated with project completion and here is where the controversy surrounding Washington Roebling's health (he was an unfortunate victim of the bends among other things) and mental capacity are manifested upon the completion...McCullough is again masterful at integrating this major poltitcal milestone with the story. "In another time and in what would seem another world, on a day when two young men were walking on the moon, a very old woman on Long Island would tell reporters that the public excitement over the feat was not so much compared to what she had seen 'on the day they opened the Brooklyn Bridge' "
Having walked and driven over the bridge many times, and having derived the name for my daughter from it, I can say that I have a somewhat personal stake and appeal in it. I also can say that I never gave a second thought about it's construction or the fascinating story that went into building it when I walked and drove it, until now. My compliments to David McCullough for giving us a marvelous story and book and giving those of us who've taken the bridge for granted a new perspective. I can't wait to go back and view it with this new knowledge of it's consruction and I'd wager that this is David McCullough's greatest gift...I give this work my highest recommendation. It is hard for me to be objective about this book. First off, I am a great admirer of David McCullough's histories. Second, I have published two novels which are set in New York during the mid-19th Century. But what probably makes it hardest for me to be objective is that I have walked over that bridge for my own personal pleasure so many times over the decades that I consider it an old friend. It's my bridge. Having said all that, I can say that Mr. McCullough has written a history that is not only about a bridge and its builders, which are fascinating subjects in their own right, but it is also about what New Yorkers were thinking back then. This was still a horizontal world; the era of early skyscrapers was a few decades away. Because of this and the rapid growth in population after the Civil War, Manhattan was mostrously choked by block after block of four- and five-story tenements, warehouses and factories. The need for a reliable means to get to the vast open spaces of Brooklyn was urgent. Ironically, however, it wasn't the horizontal--the length of the bridge--which stunned the witnesses to the construction. Instead they marvelled at the height of the towers and the height of the roadway over the East River. Not as ironic, however, were the people who didn't marvel at the bridge's beauty and the strength of its construction. They were too busy licking their lips, wringing their hands and wondering how much of the bridge's budget would make its way into their wallets. The elements of corruption, then as now, always lurked near a great public work in New York. McCullough covers this tainted side just as carefully as he reports on the glory of the growth of the bridge. Heroes (the Roeblings) and villains (Tweed & Co.) abound, while New York's most beautiful and efficient structure comes to life. I've been as honest as possible. I recommend this book highly to anyone with an interest in engineering, New York history, or just a good story with great characters. 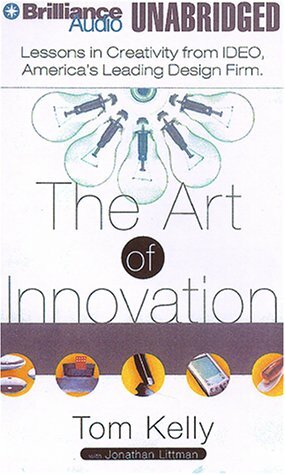 IDEO, the widely admired, award-winning design and development firm that brought the world the Apple mouse, Polaroid's I-Zone instant camera, the Palm V, and hundreds of other cutting edge products, reveals its secret for fostering innovative, out-of-the-box thinking across the world of business. There isn't a business in America that doesn't want to be more innovative and creative in their thinking, products, and processes. At many companies, being first with a concept and first to market are critical just to survive. In The Art of Innovation, the general manager of the world-renowned design firm IDEO, Thomas Kelley, takes readers behind the scenes of this wildly imaginative and energized company to reveal strategies and secrets it uses to turn out hit after hit. IDEO doesn't believe in the myth of the lone genius working away in isolation, waiting for great ideas to strike. The fact is, as Kelley points out, everyone is creative, and the goal at IDEO is to tap into the wellspring of creativity among its employees. How does it do that? First, IDEO fosters an atmosphere conducive to freely expressing ideas, throwing out (most of ) the standard rules, and freeing people to design their workspaces and environment to fit their personalities. It is IDEO's focus on teams that has resulted in its countless innovative breakthroughs - the constant give-and-take among people willing to share ideas and trust in the group process, dubbed "the deep dive" by IDEO. In entertaining anecdotes illustrating some of IDEO's own successes (and mistakes), as well as pioneering efforts at other leading companies, Kelley shows how teamsresearch and completely immerse themselves in every possible aspect of a concept or problem, examining it from the perspective of the companies they are designing for, from the perspective of safety, and from the perspective of consumers. I read this book awile back during a vacation and couldn't put it down.I only read no-fiction books and this one was the best I'd ever read.I've never felt compelled to review a book before, but his one was worth it.It was very well written, informative as well as inspirational.It made me want to go work at Ideo.Well worth your time. If you're creative, you need this tape set! If you've ever felt "stuck" or as if people weren't really paying attention to you... if you're an artist and frustrated with your own work or how others perceive some of your work... if you've ever wanted to be an artist, but didn't feel "good enough"... You need this tape set. No, I don't mean you should hear it someday; I mean that you need to get this tape set right NOW. You need to hear it. (That should be in neon lights, flashing in front of your monitor.) 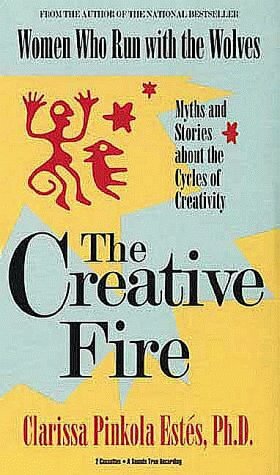 Put "The Creative Fire" on your tape player and take out a box of tissues. If you listen to it in the car, be prepared when Dr. Estes starts reading from her poem, "How to Silence a Woman," because you may be ready to vent, big time, right then & there. She's telling you the truth you've needed to hear since forever. I repeat: if you've ever felt creative, or wanted to do something creative, and felt stuck or sad or not good enough, at ANY step in the creative process (including when you finished it), you need this tape set. It is the most significant message I've heard in the past year, at least. It is really, really, REALLY important. This is one of two books/audio that I give or recommend to anyone struggling with their creativity (the other is Julia Cameron's 'The Artist's Way', the first book only). You can listen to these tapes on a regular basis and begin to remember what it all means -- why you want to create art, why it matters intensely, who is standing in your way, how to regain the spark, and how to live fully in your creative imagination. All of Estes' audio tapes are fabulous -- she has the voice and the wisdom of the mother/friend/ therapist we all wish we had in our lives. Excellent Tapes About the Creative Force Within. Patricia Seybold has advised major companies not only on the technical requirements for a successful electronic commerce strategy, but also on the management, marketing, sales, and customer support systems necessary to create an infrastructure that seamlessly blends a company?s e-commerce initiative with overall business. It all starts with customers.For the past several years, Seybold has been working with electronic commerce pioneers who have made life easier for their customers by figuring out what they want and designing their Internet strategy accordingly.Seybold?s guide is packed with insights on how both Fortune 500 giants and smaller companies have created e-commerce initiatives that place them well ahead of their competitors. With additional in-depth examples from American Airlines, Amazon.com, Babson College, Bell Atlantic, Dell Computer, PhotoDisc, General Motors, and Cisco Systems, Customers.com is an exceptionally rich source of ideas and information; the one audiobook you need to stay in business in the rapidly changing era of electronic commerce. CUSTOMERS.COM is a very valuable book in that it focuses both on how to serve customers on-line as well as how to make money doing so. Like a good consultant, the author systematically looks at best practices from each of 16 cases, and combines the lessons into a vision of the future best practice (in 2-3 years) that no one is yet doing. This is an outstanding accomplishment, that is not matched in most best practice books. I also visited the CUSTOMERS.COM Web site to register for the free booklet that is offered, and was pleased to get many ideas to improve our own electronic commerce. Be sure to check here from time to time, because the author updates the 16 case histories in the book on the Web site so that you can keep up-to-date. That is an especially nice touch. Ms. Seybold does a nice job in CUSTOMERS.COM of critiquing each case history for ways that organization could improve. Let me do the same for her book. Several things stand out. First, the book does not go into enough detail about how to find the weaknesses in current operations that will permit greater profitability through changed processes facilitated by electronic commerce. There is a lot of best practice work needed in those areas before you start thinking about electronic commerce. Second, she does not address the question of what the ideal best practice of electronic commerce is. You might think of a well-informed concierge in a great hotel who knows you well as the model for this ideal best practice. Third, more needs to be done to help you learn how to facilitate the change process. 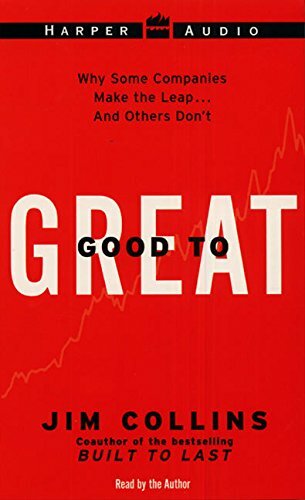 The steps she describes would be very difficult for many organizations to implement that are beset by severe stalls in the form of tradition, disbelief, misconceptions, bureaucracy, avoiding the unattractive (such as customer problems), procrastination, and miscommunication. Fourth, the book highlights a lot of very interesting case histories and shows their successes. I was struck that although I am a heavy Web user and a substantial customer of many of these organizations, I did not know about the electronic services they offer. It sounds like many of these organizations still have a communications problem with their customers. Fifth, the available technology will advance a lot in the next five years. I felt the book does not do enought to make people aware of how technology that is not yet available can facilitate the future success of their electronic commerce. No book can serve all needs in an area, so we can look forward to Ms. Seybold's next book. I enjoyed the personal touch as she described her own experiences with many of the companies involved. I hope she keeps in touch with them and us. I suspect she will based on the e-mails I get from her after registering on her site. 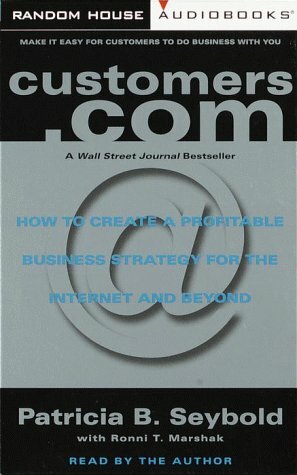 Although it was just published in 1998, Customers.com quickly attained the status of an Internet business classic. Of course, that title might be a bit dubious now that the book has outlived many of the companies that tried to put its strategies into practice. But despite your view on the viability of e-businesses, there's no denying the innovation and thoroughness of Patricia B. Seybold's work. Don't be misled by her breezy style; this is an authoritative and informative book. Seybold gets right to the heart of the links between business and technology. Using plenty of examples from major corporations, she suggests eight major strategies for harnessing the power of technology, especially the Internet, to advance your business. Since the book's initial publication, many other authors have espoused these e-tenets, but we [...] advise you to read the original - Seybold probably said it first, and probably said it best. Remember, the collapse of the tech bubble didn't wash away the Internet, which could still prove to be a critical element of your business. Good book but needs updating now. With so much changes in the internet business, this is a good reading to understand how should you start, but new technologies are available now. This book was written in 98, so Patricia Seybold should rewrite. 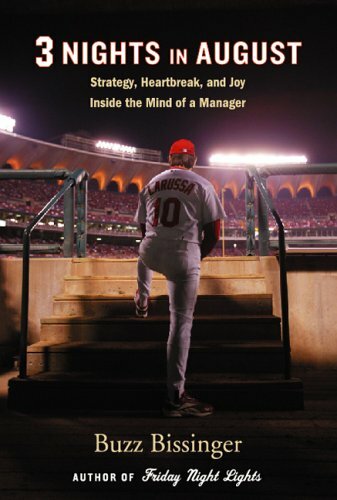 Being a college student, I was at first reluctant to read Seybold's book as a class assignment. In hindsight, it's one of the best decisions I could've made. This book presents dynamic ideas that are being overlooked at universities today. Rather than focusing on the "how to's" Customers.com gives you the "why's" of the customer market. Talk about making me think! Not only did this book provide an excellent point of reference for class discussions, I found myself unconsciously transferring the knowledge into my job. One thing to take note of: THIS IS MORE THAN A TECHIES BOOK! Anyone in business will undoubtedly benefit from reading it. HIGHLY RECOMMENDED!!! From Kenneth C. Davis, author of Don't Know Much About' Geography, Don't Know Much About' the Civil War, and Don't Know Much About' the Bible, comes a lively presentation of the phenomenal bestseller that has brought American history to life for hundreds of thousands of readers. From the first settlements of the continent through Vietnam, Watergate, and Reagan, Davis takes listeners on a rollicking ride through 600 years of Americana. 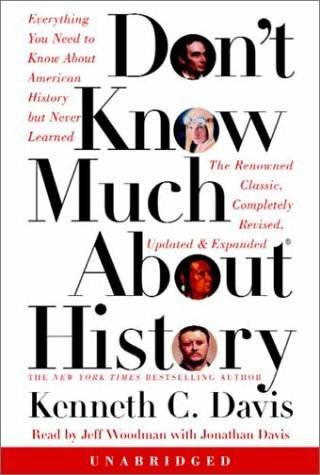 With wit, candor, and fascinating facts, Don't Know Much About' History explodes long-held myths and misconceptions-revealing the very human side of history that the textbooks neglect. In this entertaining presentation, you'll meet the personalities who helped shape our nation and hear the words and wisdom that have endured through the centuries. From the French and Indian War to Vietnam, from George Washington to George Bush, here is the story of how we got to where we are today-and the questions that have plagued most of us since grade school are more interesting than ever before. Informative and Entertaining - Lacking Some Basics? Having last studied American history in high school, I purchased this book in an attempt to understand the historical roots for our country's current political biases. Is our current foreign policy based on 200 years of fine tuning, or are we simply repeating mistakes from our past? This book provides useful information on the major events in America's history, and the author's question and answer style turns a potentially dry subject into an entertaining and fast-moving read. Mr. Davis also does an exceptional job of providing "softer" context around each event, enabling the reader to view and analyze our leader's decisions within the intellectual, philosophical, and social frameworks of their time. My one complaint about the book is that it, perhaps, presumes we know too much of the basics. While giant event descriptions are given more than adequate treatement (e.g. WWI and WWII), Mr. Davis sometimes debunks myth or presents the latest research for smaller happenings without providing basic facts (i.e. who was that guy, exactly?). Still, I was quite happy with the book, and would recommend it to anybody seeking an adult's perspective on our nation's past. I bought this book several years to help me prepare for the State Department's Foreign Service written exam. I was pretty confident in my knowledge of foreign affairs and European history, but less so about the events that had occurred right here in my own backyard for the past 200+ years. Well, it really helped! I particularly remember questions on the exam about the Monroe Doctrine, the Missouri Compromise, and Marbury v. Madison that I could not have answered had I not read this book. I passed the exam, which is one of the most draining tests I have ever taken. It's like a super-SAT for adults. Recently, I picked up this book again and thumbed through it. 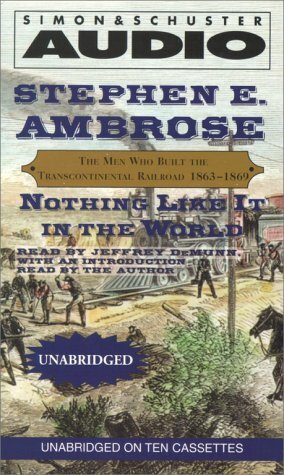 My one criticism is Davis's "anti-Manifest Destiny" rhetoric, which is true, I suppose, of most modern historians, with the exception, perhaps, of the incomparable Stephen E. Ambrose. General George A. Custer described as "probably deranged" is pure hokum revisionism! It's straight out of "Little Big Man," the 1968 movie with Dustin Hoffman. Anyhow, that's my one beef in an otherwise fun and engaging read. Kenneth Davis' book about American history needs to be compared and contrasted with other recent American history books such as James Loewen's _Lies Across America_. Davis writes another US history including things which he considers everything you need to know, historical shortcomings. "Truth isn't cosmetically perfect, " he writes. Quite often history is skewed by myths and misconceptions. 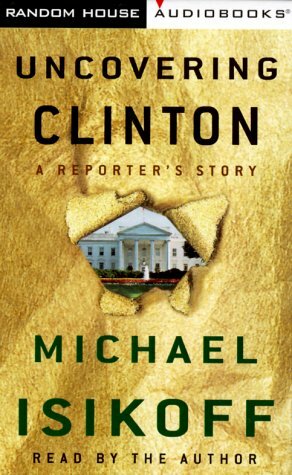 Davis writes along the traditional line of history from America's "'discovery' by Europe" to the Bill Clinton administration. His intention is to write a narrative that could be read from beginning to end and debunk myths and misconceptions along the way. In that regard he has done a good job. However Davis has a far gentler attitude than Loewen. 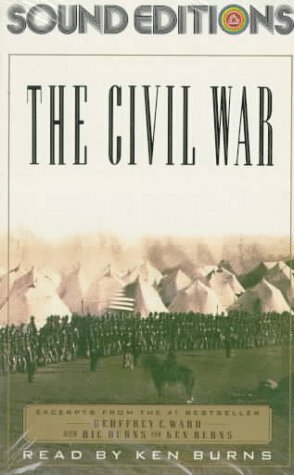 Davis writes a good overview of American history, summarizing some of the key and decisive events of the past. While no substitute for a text book, Davis makes interesting subject areas which have put generations of high school history students to sleep. As augmentation to a prescribed course of study, or as a refresher for a HS/college graduate, this book is worth reading. A word of caution. This is not a 'bare facts' history. Davis' writing style is heavily laced with very liberal editorialism. Davis also tends to insert his own opinions as fact. Overall he seems to view American history through liberal hindsight, rarely hesitating to impose his own value judgements on historical events and decisions made by political, military and business leaders. Don't Know Much About History Indeed!